The Enduro HyGlide hybrid seals combine the best of both worlds, oil retention and dirt/debris rejection. This design provides world-class performance in a long-lasting seal and delivers smooth action throughout the entire travel of the fork. This unique design joins the oil seal and wiper into a single unit, creating an ideal fork seal. The integrated top wiper is produced using a specific formulated polyurethane material, rather than a rubber compound that many fork seal manufacturers use. Our poly wiper/seal is a proper wiper keeping dirt and the elements out. In testing it is 300% more effective than a rubber wiper with garter spring used by many leading seal manufacturers. The co-molded oil seal below is made from Polyacrilate, the perfect material for the extreme operating temperatures and high pressures. The oil seal is also infused with MOS2 (Molybdenum Disulphide), a dry lubricant similar to graphite. While this is is the optimal material for the oil seal, it is separate in its duties from the upper wiper and is the reason for combining materials in to one hybrid seal. This cold-fused design allows the elimination of 1 sealing lip and further decreases the friction or “stiction” as referred to regarding fork movement. Between the two sealing lips, we have designed a large cavity area to hold lubricant to again prevent contamination and easy movement of the reciprocating fork producing more active suspension. With superior sealing action and cleaner fork lowers, your fork service intervals can be increased we find by 2 or 3 times compared to what the OE recommends. The HyGlide integrated wiper and oil seal provide much easier installation. No more fussing with a very thin lower seal that is fragile and easily bent when trying to install. Enduro Bearings invented, designed and formulated polyurethane wipers for the mountain bike fork. Standard designs are plagued by “stiction” contamination and quick degradation of overall performance. 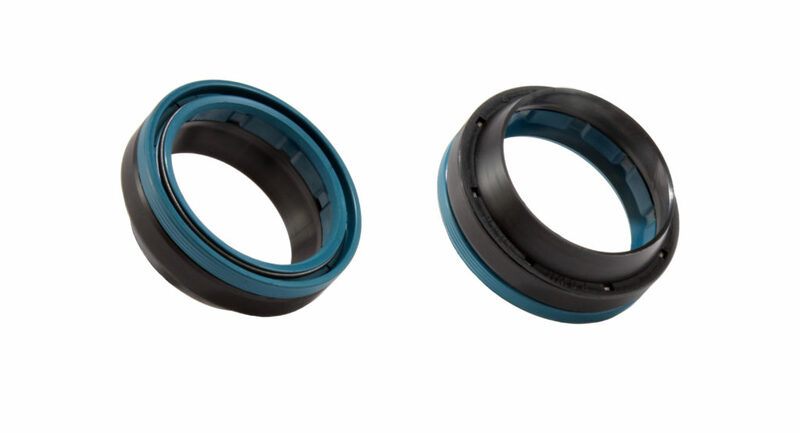 Enduro Bearings signature Blue Polyurethane wipers solve these problems, upgrading performance in all of these areas, especially smooth performance over long periods without maintenance. They keep the dirt out and the oil inside. Enduro Bearings wipers seal better, move faster, are slicker, last longer, and run quieter than stock wipers. And now coming with Moly Disulphide lubricated lower oil seals, your forks will move quicker still while never leaking a drop of oil. Available for most major brands and models of suspension forks at substantial savings and improvement over stock wipers.